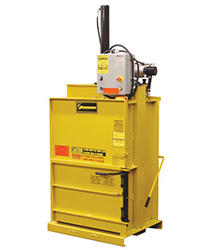 Harmony Has A Vertical Baler Solution For Every Type Of Material, Size, or Industry! 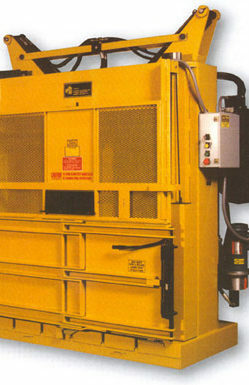 Our downstroke balers are known for their durability, reliability, and heavy duty construction. They are available in sizes from 30" to 72", bale a variety of materials, and can be configured with a wide range of options. Let our experienced and knowledgeable sales team provide you with the best vertical balers for sale on the market! Contact Us Call us today at 507-886-6666. Bale Size: 24" x 30" x ≤ 25"
Bale Wt. (OCC): ≤ 145 lbs. Bale Wt. (OCC): ≤ 240 lbs. Bale Wt. (OCC): ≤ 180 lbs. Bale Wt. (OCC): ≤ 300 lbs. Bale Wt. (Alum): ≤ 120 lbs. Bale Wt. (OCC): ≤ 750 lbs. Bale Wt. (OCC): ≤ 800 lbs. Bale Wt. (OCC): ≤ 1,000 lbs. Bale Wt. (OCC): ≤ 1,100 lbs. Bale Wt. (OCC): ≤ 1,300 lbs. Bale Wt. (OCC): ≤ 1,200 lbs. Bale Wt. (OCC): ≤ 3,000 lbs. Bale Wt. (OCC): ≤ 1,500 lbs.